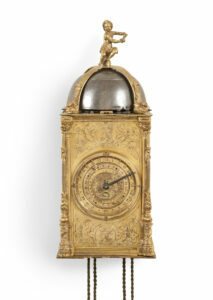 The spring-driven, day-going movement of this figure clock is constructed between brass plates. It consists of going and striking trains. 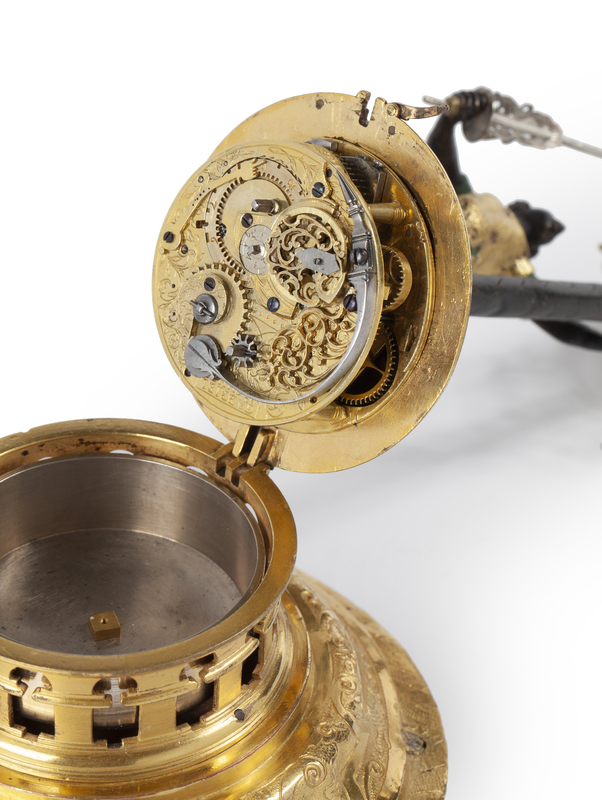 The going train has a spring barrel, stack-freed and verge escapement with balance. 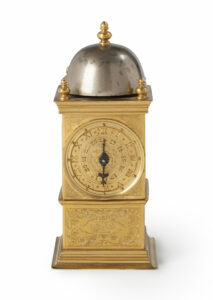 The striking indicates the hours fully on a bell whilst activating the automata. The maker has signed the movement on the backplate in the following manner: Gabriel Aichner. There is a revolving sphere on top of a pillar which has a silvered brass chapter ring divided into Roman numerals with half-hour markers. The time is indicated by a fixed steel pointer which the moor holds in his hand. 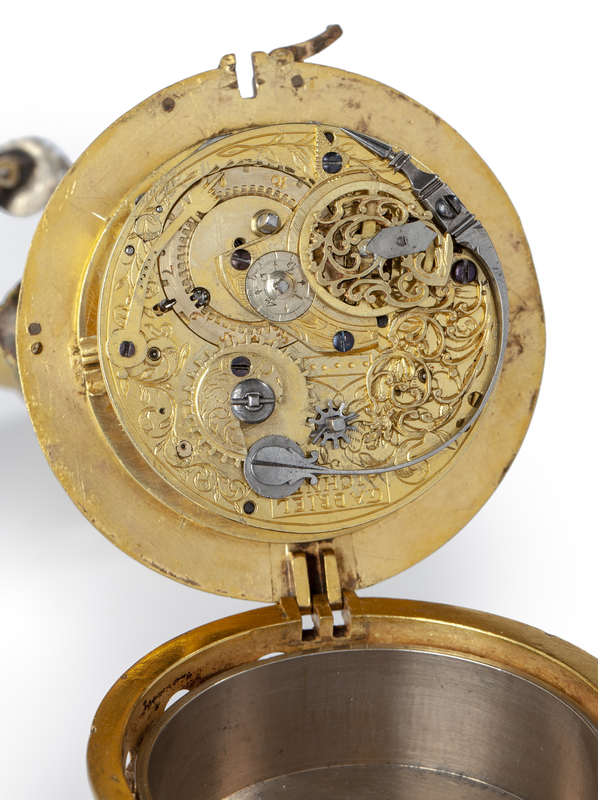 The engraved firegilt case has a base in which the movement is housed. It has a pierced gallery all around which serves as sound frets for the bell. The pillar is situated on this base. The movement can be accessed by opening a hinged base plate with a catch, revealing the richly embellished backplate. 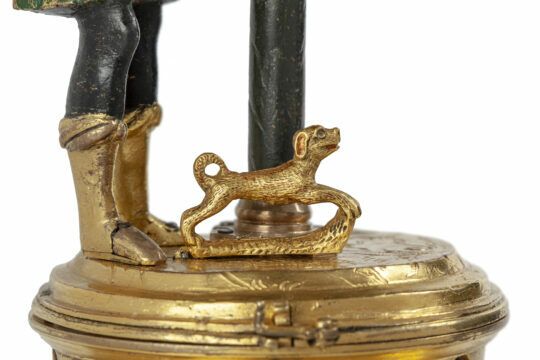 The patinated moor dressed in green with a gilt brass top is standing on the base with a dog at his feet. He holds the pointer in his right hand and the pillar with his left hand looking up. 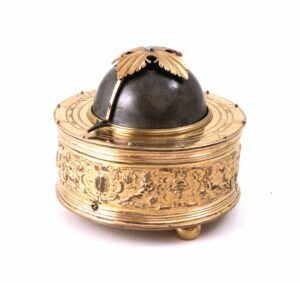 The sphere is surrounded by a ornamental gilt brass ring which is seemingly carried by two griffin heads. When the automata are activated, the moor and the dog move their heads. The clock rests on three raised bun feet. Gabriel Aichner was active as a clockmaker in Augsburg of Nuremberg at the end of the 16th and the beginning of the 17th centuries. 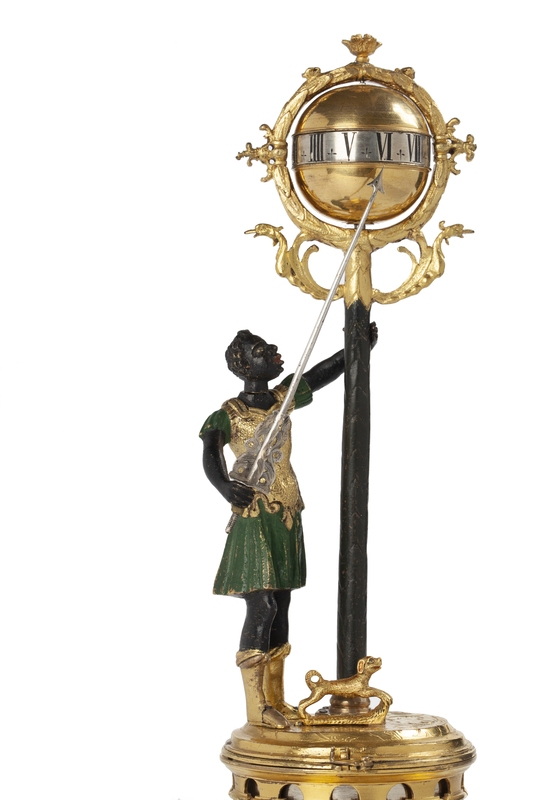 Several of his clocks are known, such as a horizontal table clock, a crucifix clock and a Türmchenuhr dated 1631.